OAKLAND — The Your Black Muslim Bakery CEO pondered killing his brother-in-law because he was giving information to journalist Chauncey Bailey about the bakery, according to a transcript of grand jury testimony. But Yusuf Bey IV backed off ordering Ali Saleem Bey killed because he didn’t want to anger his older sister, Saleem Bey’s wife, according to the testimony in April by Devaughndre Broussard, the confessed killer of Bailey. Bey IV was livid that Saleem Bey was talking with the reporter and wanted him to die for it, Broussard said. “He was like, ‘We should get him, too, but my sister will be mad. She be tripping on it,'” Broussard quoted Bey IV as saying during their plot to kill Bailey. So Broussard said he was instructed to only kill Bailey — which he did the morning of Aug. 2, 2007. He has pleaded guilty to the slaying. Saleem Bey in an interview Friday said he had no doubt as to the truthfulness of Broussard’s testimony. Bey IV, he said, “thought he was Teflon” in the summer of 2007. By the time the threat Broussard said was made, two other men were dead and a kidnapping and torture investigation of Bey IV was more than two months old with no arrests, Saleem Bey said. Saleem Bey was the confidential source that Bailey, editor of the Oakland Post, used to write a story about the bakery’s finances and internal strife. Post publisher Paul Cobb held the story for better attribution. Bey IV, however, learned of the upcoming article and ordered Broussard and another of his followers to “take him out,” Broussard told the grand jurors, according to an 800-page transcript that a judge ordered unsealed Thursday at the request of the Chauncey Bailey Project. Saleem Bey blamed police for Bailey’s death, saying they enabled Bey IV to believe himself untouchable by the slow and poor investigation of his suspected crimes — such as the kidnapping case. Saleem Bey ripped suspended police Sgt. Derwin Longmire for being Bey IV’s “big brother” and protector. Bey IV was secretly recorded saying Longmire, the lead investigator on the Bailey case, protected him from charges. Longmire used Bey IV to help persuade Broussard to confess, leaving them alone for about seven minutes and not recording their conversation. The Chauncey Bailey Project reported in November that Longmire’s case notes on Bailey’s killing didn’t include evidence showing Bey IV at the center of a conspiracy to kill the journalist. He was suspended in April. The department is going through the process to fire him. Saleem Bey contends that Bey IV should have been in custody well before Bailey’s killing, which was the culmination of years of acrimony in the family over the bakery, a successful business and longtime symbol of black empowerment in Oakland. A rift in the family occurred after the death of bakery founder Yusuf Bey in 2003. His appointed successor, Waajid Aljawwaad, disappeared Feb. 27, 2004, and was found dead in July 2004, buried in a shallow grave in the Oakland hills. Bey IV’s older brother, Antar Bey, took over as leader. Saleem Bey and others left the organization. 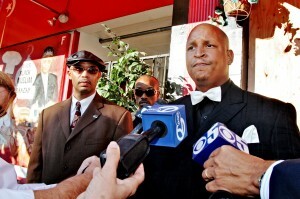 In June 2005, his ally in the dispute, John Bey, survived a shooting that Saleem Bey and others have said was carried out by supporters of Antar Bey. Yet afterward, police wouldn’t grant Saleem Bey a concealed-weapons permit “so I could protect myself,” he said. Records show his application was rejected. Bey IV became bakery leader later in 2005 when Antar Bey was shot to death. On Thursday, Superior Court Judge Morris Jacobson refused to issue a gag order in the case and unsealed the transcript of the grand jury testimony, both in response to requests by the Chauncey Bailey Project. The transcript contained the testimony of 15 witnesses, much of it previously reported. Broussard “spoke of killing like some people talk about what they had for dinner,” Lamiero, a Deputy Alameda County District Attorney, told the 18-member panel, according to the transcript. Lamiero, who has not discussed the case publicly and who declined to be interviewed Friday, told the grand jury that Bey’s alleged order to kill Odell Roberson, who was shot dead in Oakland in July 2007, was a textbook example of a planned killing. “I can’t think of a greater example of premeditation and deliberation than one who is acting on orders and to look for an opportunity, and if that opportunity presents itself, to kill a human being,” he said.